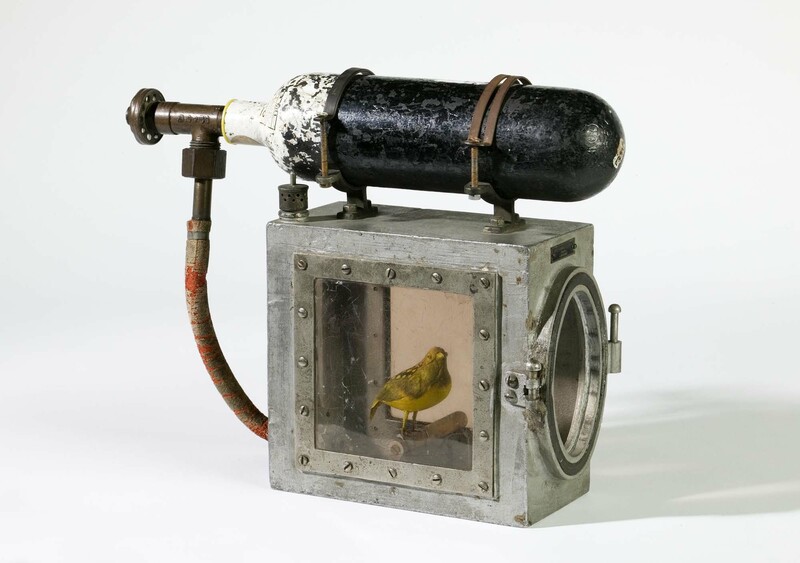 Lewis Pollard, the curator of the Museum of Science and Industry in Manchester, England, recently highlighted his favorite object in his museum's collections--this gadget, created circa 1896, used to resuscitate canaries in coal mines. For about a century--from the 1890s through the 1980s--British coal miners had a tradition of lowering canaries into a coal mine to detect the presence of noxious gases. As the BBC explains, the "canary is particularly sensitive to toxic gases such as carbon monoxide which is colourless, odourless and tasteless. This gas could easily form underground during a mine fire or after an explosion. Following a mine fire or explosion, mine rescuers would descend into the mine, carrying a canary in a small wooden or metal cage. Any sign of distress from the canary was a clear signal the conditions underground were unsafe and miners should be evacuated from the pit and the mineshafts made safer." In deciding to send canaries into the mines, inventors came up with the somewhat humane device shown above. According to Pollard, the circular door of the cage "would be kept open and had a grill to prevent the canary [from] escaping. Once the canary showed signs of carbon monoxide poisoning the door would be closed and a valve opened, allowing oxygen from the tank on top to be released and revive the canary. The miners would then be expected to evacuate the danger area." This practice continued for almost 100 years, until canaries officially started to get replaced by technology in 1986. Read more about Pollard's favorite object here.